“Despite his tough-guy image, Hartack had a soft side. Above all, he loved the horses he rode and always looked out for them. As noted above, he would refuse to ride an animal he felt was unfit or unsound, and at times even had his mount scratched at the starting gate, to the dismay of owners and trainers." Bill Hartack’s world-renowned legacy grew from a talent discovered early-on by a trainer in West Virginia. Born in 1932 in the coal mining town of Ebensburg, Pennsylvania, William John Hartack was raised by his father after losing his mother in a car crash at age 8. Hartack, who was originally sensitive about his smallness, would learn to prize it once he gained employment at age 17 as an exercise rider and stable boy for trainer Junie Corbin at Charles Town Race Course. Hartack was known to be an intelligent young boy and was honored as valedictorian of his high school class. Noticing Hartack’s special touch for riding horses, Corbin signed him up as a contract rider in 1952. By the end of the next year, he was a racing star. Hartack was famous for not taking excuses from those around him, a no-nonsense type of guy. He said, “I might not be right but it’s my own opinion. If I have to ask somebody else what my opinion is, I’m not much of a man.” He never failed to give the media an ear-full, but he also gave them their cover stories. 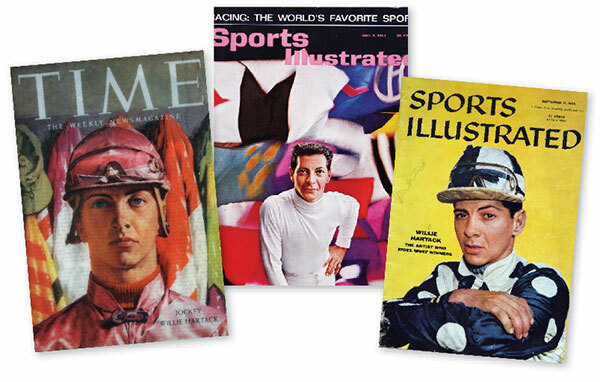 He was featured on the cover of Sports Illustrated in 1956 and 1964, and on the cover of Time magazine in 1958. Bill Hartack’s name permeated racing stories everywhere as he broke and set records left and right. He was the second jockey to ride 400 winners in a single year. Continuing the hot streak in 1956, he rode 1,702 races while maintaining that record the following year. Hartack was the top rider in earnings in 1956 and 1957. He also claimed the title as the first jockey to earn $3 million in a year, a level no other jockey reached for 10 years. As the world noted both his drive to win and his skill on a horse, the National Museum of Racing and Hall of Fame announced that Hartack would be inducted into the Hall of Fame. In 1959, at the age of 27, Hartack became the youngest inductee in racing hall of fame history. Such zeal led him to reach the pinnacle of racing in 1969 when he became a five-time Kentucky Derby champion, a title he shares with only one other jockey, Eddie Arcaro. 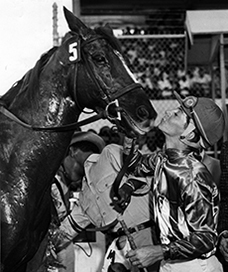 Hartack's previous Kentucky Derby wins took place in 1957, 1960, 1962 and 1964. Additionally, Bill Hartack claimed three wins at the Preakness Stakes, in 1956, 1964 and 1969, and one win at the Belmont Stakes in 1960. In 1974, Hartack laid down his whip and retired. During his racing career in the United States, between 1953 and 1974, Hartack rode 4,272 winners in 21,535 mounts. However, he was unable to shake his love for riding. Four years later in 1978, he raced in Hong Kong. He stayed for two years and finally closed his career as a jockey in 1980. Hartack never married and lived the rest of his life loyal to his true love, racing. He continued to feed his passion by working in administration and then as a steward for a number of tracks. His last position was as a steward at Louisiana Downs in Bossier City, LA. Enjoying a long life of horses and later a bit of hunting, Bill passed away at age 74 from heart disease in 2007. Those who knew him were greatly inspired by his focus and talent. Bill Hartack lived to ride and leaves an unsurpassed legacy to those jockeys who strive to follow in his rose-colored tracks. He will always be missed, and will forever be honored by the racing industry and the foundation that bears his name.